My mother has been going through things at my grandmother's house and mailing me small collections of interesting odds and ends she finds. 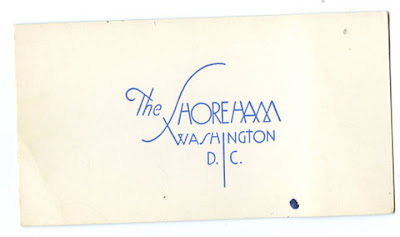 This letter-press blotter card from the Shoreham Hotel with an elegant, earlier incarnation of their logo is a keeper. And a mystery. I can't possibly imagine who among my kinfolk from Arkansas found themselves at a luxury hotel in Washington.